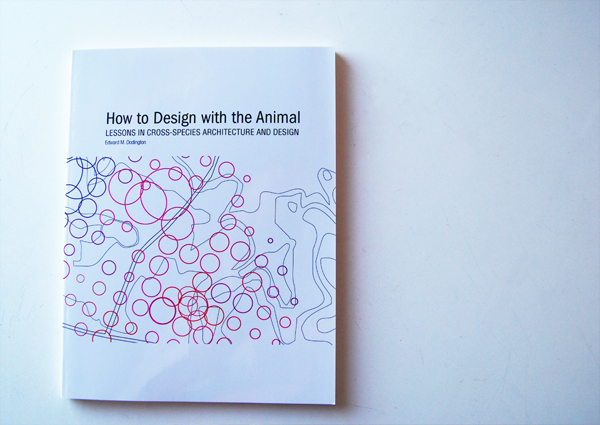 How to Design with the Animal is a forth-coming publication and culmination of four years of Graduate School architecture research for Edward Dodington. The work is a collection of current and recent projects and text adressing both simple and complex issues one encounters when they begin to design with Animals at the forefront of their minds. Please stay tuned for information and links for available copies on lulu.com. Working with and designing with other, non-human, biological species is one of the deepest challenges facing architecture today and human development in general. Rather than to preserve, or cater to outside species this AnimalArchitecture demonstrates that Architecture can actively participate in the life around it. By directing, responding to and intervening in, manipulating, or restrategizing the sensorial terrain (audible, olfactory, or haptic) of individual species, architecture and infrastructure can become redefined as animal players in a much larger system. As a sensorial device, or a device tuned to respond to larger environmental systems architecture can become part attractor, part program container and part animal/architecture interface. Animals and ecosystems would then begin to influence the siting and design of individual buildings and they in turn would attract individual species while also being subject to larger migratory, or environmental patterns. And, more than providing a space for program, a new posthumanist architecture could offer the visitor with the experience of participating in a conversation with another animal. Ned is a NexGen shining ray of hope urban animals across America. Money and avarice play vital roles in the developing land scape that it is relief to hear someone with the gift and tenacity to incorporate human and non human animals in our most basic of architectures – I can only hope more architects follow his lead!